Advance Review: DC Superhero Girls: Search for Atlantis – AiPT! Regardless of what age you are, you can definitely find a few things in Search for Atlantis that you can enjoy. 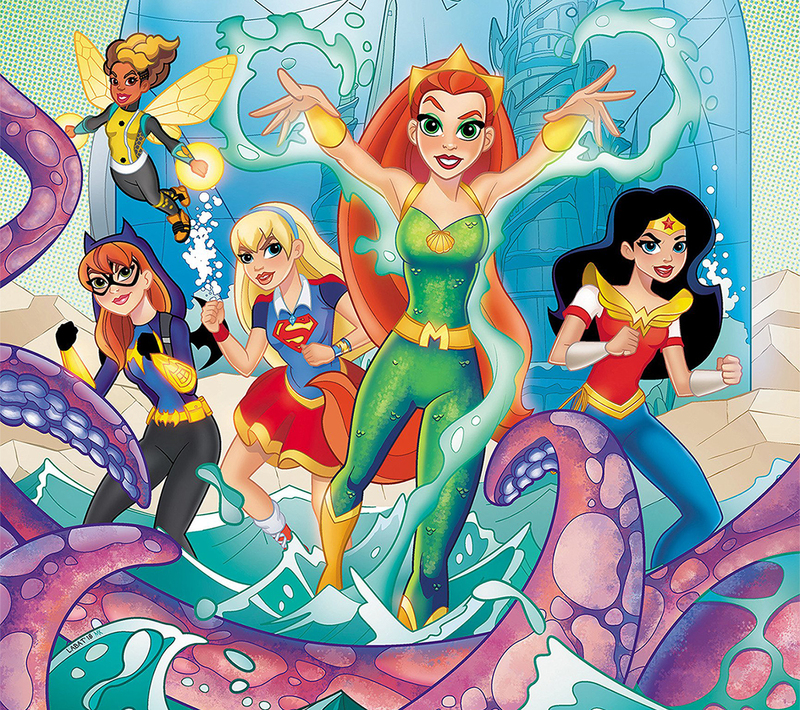 Search for Atlantis is the seventh DC Superhero Girls graphic novel that DC has released and the first one to include the underwater marvel Mera. For those unfamiliar, DC Superhero Girls is a franchise that includes a TV show, numerous films, action figures, and, of course, graphic novels. The novels and show follow a group of superpowered high schoolers attending the aptly-named Super Hero High. With a young audience in mind, the episodes and novels typically showcase themes such as friendship, honesty, and kindness. In Search for Atlantis, Super Hero High takes a field trip to Mera’s hometown of Atlantis. During the journey, Bumblebee begins to notice Wonder Woman spending more and more of her time with Mera. As Wonder Woman’s assumed best friend, Bumblebee is offended but keeps those thoughts to herself. As they near Atlantis, Mera begins to notice that something is a little off. When they finally arrive, her sense of unease becomes clear: Atlantis is gone! The rest of the novel follows Mera, Wonder Woman, and the other students as they try to hunt down who captured the once lost city of Atlantis. In the end, they find the city and Bumblebee learns how to have more than one best friend. While the plot isn’t exceptionally complex, it doesn’t really have to be. DC Superhero Girls is geared toward kids, and this graphic novel fits the bill perfectly. That being said, as someone considerably older than the target audience, I still enjoyed writer Shea Fontana’s clever dialogue and artist Yancey Labat’s adorable characters. Regardless of what age you are, you can definitely find a few things in Search for Atlantis that you can enjoy. My favorite part of the book is how diverse the cast is. Since DC owns the franchise, they can include any and all DC Comics characters that they want — and they include a lot. The ordinary cast of Batgirl, Supergirl, Wonder Woman, and Bumblebee is supplemented with characters such as Raven, Starfire, Ms. Martian, Cyborg, and, of course, Mera. We even get a little Aquaman cameo near the end. As someone who loves the DC universe, I really enjoyed seeing these cute versions of some of my favorite characters. The term “cute” to describe these fearsome superheroes may seem a little silly, but trust me: they’re adorable. Labat perfectly parallels the cartoony style seen on the TV show while still bringing his own flair to the character designs. In some of the panels, Labat’s figures could be a little more proportional and his backgrounds could be a little more detailed, but overall, I thought the art was successful. Still, if you’re not a fan of a more fun, cutesy style, this book isn’t for you. If it isn’t for you, though, it might be good for your kids. The plot, art, and wholesome themes make this the perfect “first comic book” for any kids eager to dive into the world of superheroes. Nowadays, most comics aren’t made for kids, which can make raising a little Wonder Woman difficult. With graphic novels like Search for Atlantis, it’s easy to get kids interested in the world of comics without having to buy them something they won’t understand or enjoy. Of course, I’d highly recommend reading it as well, after your son or daughter has gone to bed. Once you suspend some disbelief, it can be a really fun read. From the cover, DC Superhero Girls may seem like just another kids book, but don't be so easily fooled. While I'm sure your daughter or son would enjoy this comic, you can enjoy it too. Fantastic art and a wide variety of characters make Search for Atlantis the perfect read for any comic book fan -- young or old. Diverse range of characters from numerous DC series. Interesting plot that takes readers outside the typical Super Hero High problems. Positive themes that make it perfect for younger readers. Adorable art that parallels the DC Superhero Girls TV show. The art and plot might be too simple and cute for more serious readers. In some of the panels, Labat's art looks slightly distorted.